While the AP story (on the USA Today website) doesn't say whether Elizabeth Lloyd was at a New Jersey park in May 2010 to watch a Manchester Township Little League game, Nicholas Huba's story in the Asbury Park Press says that Lloyd, who recently sued young Matthew Migliaccio, was there to watch her son play. Ms. Lloyd was apparently seated at picnic table adjacent to a fenced-in bullpen area where 11-year old Migliaccio was warming up a pitcher. That's young Mr. Migliaccio in the accompanying photo, sitting on the bench where he says Ms. Lloyd was sitting when he uncorked a wild throw. Instead of hitting the pitcher's glove, Migliaccio's ball sailed 10 feet over the other kid's head, hitting Ms. Lloyd in the face. In an article posted June 26, the Newark Star-Ledger quotes Migliaccio in an interview with Good Morning America as saying, "I went over to see if she was okay, and she said that she was fine and not to worry about it." But Huba's account for APP.com says Lloyd "was taken to a hospital emergency room after the May 2010 incident – [she] had to undergo reconstructive surgery and suffers from headaches." Lloyd is alleging "multiple fractures," Huba writes. And Lloyd is alleging that Migliaccio hit her intentionally, according to Huba. Huba quotes Riaz A. Mian, Lloyd's attorney, as charging Migliaccio threw "his best fast ball over the bullpen into the picnic area, striking my client in the face." The lawsuit filed April 24 alleges Migliaccio's errant throw was intentional and reckless, "assaulted and battered" Lloyd and caused "severe, painful and permanent" injuries. A second count alleges Migliaccio's actions were negligent and careless through "engaging in inappropriate physical and/or sporting activity" near Lloyd. She continues to suffer pain and anguish, incur medical expenses and has been unable to carry out her usual duties and activities, the lawsuit says. And Lloyd's husband, in a third count, is suing for the loss of "services, society and consortium" of his wife. At this distance, it's easy to be snarky: Can the mother of a Little Leaguer not know that it's a bad idea to sit anywhere near the area where catchers are warming pitchers? (It's also a good idea not to sit behind the first baseman when he tries to warm up the infield.) Can a typical 11-year old Little Leaguer really throw hard enough to break glass, much less someone's face? But even assuming Ms. Lloyd really was seriously injured, why would she sue a little kid? I don't pretend to know what the law may be in New Jersey, but -- in Illinois -- there may have been no one else to sue. In Illinois, the Baseball Facility Act, 745 ILCS 38/1 et seq., and the Recreational Use of Land and Water Areas Act, 745 ILCS 65/1 et seq., would operate to severely limit Ms. Lloyd's choices about whom to sue. And this isn't just a blogger speculating: Debbie Vaughn was hit by an 11-year old's errant warm-up throw in 2005 while watching her son's game at West Frankfort Park in downstate Franklin County -- and the Illinois Appellate Court found that these statutes barred her claims against the West Frankfort Recreation Association and its alleged agent, Jarrod Barton, the coach (and father) of the kid who uncorked the errant throw. Vaughn v. Barton, 402 Ill.App.3d 1135, 933 N.E.2d 355 (5th Dist. 2010). However, just because there may not be a statute (yet) immunizing kids from the consequences of making bad throws while warming up to play baseball doesn't mean it's a particularly good idea to try and sue a kid. 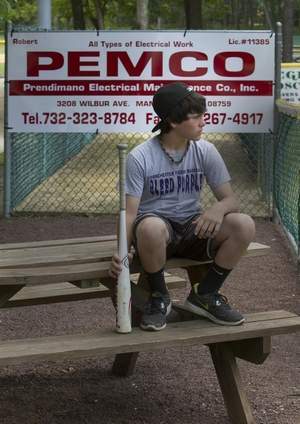 If you look at the news coverage swirling around the Migliaccio case, you'll note that the young man's father and the young man's attorney are both angry that Little League is not coming to the boy's defense. The important part of this, though, is that the Migliaccio family's homeowner's insurance will be providing a defense for this suit. And bringing a motion to dismiss in rather short order, I expect. The email took me by surprise this afternoon: "The Appellate Lawyers Association regrets to inform you of the death of Justice Joseph Gordon of the Illinois Appellate Court." The Chicago Daily Law Bulletin reports tonight that Justice Gordon, 79, suffered a fatal heart attack while working at his desk. I had the pleasure and privilege of appearing in front of Justice Gordon many times but my favorite memory of Justice Gordon concerns a case that never even got briefed. Justice Gordon conducted the one and only Rule 310 Prehearing Conference I've ever had in that court. I'd been hired to represent a young doctor in an appeal from a judgement obtained against him by the State of Illinois. I can't go into the particulars, of course. I can say that the young doctor and his original attorney turned down a number of chances to settle in the trial court and they shouldn't have. By the time the doctor saw the light, however, the State was no longer willing to settle. Nevertheless, Justice Gordon made a heroic effort -- and he persisted, even when the State became intransigent. Indeed, the more the State refused, the harder he tried. It was a long and ultimately frustrating day. The prehearing conference didn't work, in the end, but I will remember Justice Gordon's effort if I live to be 110. Justice Gordon will be sorely missed. I went to an arbitration hearing the other day. I was the plaintiff in a small property-damage claim, against a substandard carrier. I presented my side to the arbitrators as did the defendant. I was not aware of Supreme Court Rule 90(c) until after the arbitration meeting. The arbitrators never asked me for a copy of the repair estimate I had with me. After the arbitration meeting, the clerk at the Skokie Courthouse told me that I had won, but that the award was zero dollars because I did not prove damages. If I reject the award, will the same arbitrators be involved in reviewing the 90(c) package that I will be submitting? Why didn't any of the arbitrators ask for my damage estimates? If MC has these kinds of questions about court-annexed arbitration in Cook County, others may as well. Failure to be aware of Rule 90(c). "[A] party who chooses to proceed pro se must comply with the same rules of proceedings as an attorney." Paddock v. Department of Employment Security, 184 Ill.App.3d 945, 540 N.E.2d 1053, 1055 (1st Dist. 1989). "A pro se litigant while traversing the procedural minefield of litigation is bound to strict compliance with the requirements of the statute." Dolido v. Zenith Radio Corp., 194 Ill.App.3d 268, 272, 550 N.E.2d 1225 (1st Dist. 1990). "While reviewing courts are open to all persons who seek redress of their grievances, a party's decision to appear pro se does not relieve that party from adhering as nearly as possible to the requirements of the rules of practice enunciated by our supreme court," Peeples v. Johnsburg. 403 Ill. App. 3d 333, 335, 932 N.E.2d 612 (2nd Dist. 2010, quoting McCutcheon v. Chicago Principals Association, 159 Ill. App. 3d 955, 960, 513 N.E.2d 55 (1st Dist. 1987). In other words, folks like MC are free to proceed without a lawyer ("pro se" merely means "for oneself") but they are assumed to know everything that a lawyer should know about how to conduct their hearing. Think about that: Lawyers have years of specialized education and must pass a licensing exam. And not all lawyers are equally comfortable in court; there are many, many great lawyers who would be completely lost in a courtroom... or even at an arbitration. So... people are free to represent themselves in an arbitration, but is it really a really good idea? Rule 90 is no magic talisman. What Rule 90(c) does is provide a streamlined method for the introduction of evidence at -- and only at -- the arbitration hearing. The arbitrators never asked me for a copy of my repair estimate. Maybe it's different on Judge Judy or The Peoples' Court, but at an arbitration hearing, the parties are responsible for presenting their own case. I believe arbitration is statewide now but, when the program came to Cook County, it was as part of the first expansion of the concept from a pilot program in Winnebago County. I was in the first class of Cook County arbitrators somewhere around 20 years ago; our training materials included a video from Rockford. If I recall correctly, the arbitrators in the videos asked a lot more questions than was ever customary in this jurisdiction. But these questions were meant to clarify or assist the arbitrators' understanding of the facts presented; there was never a suggestion that arbitrators should ask questions that would lead a party through his or her case-in-chief. A timely rejection of an arbitration award gets a case back on the trial call. There is no second chance at arbitration. The streamlined procedures of Rule 90 will not apply at trial. And if it is difficult for a party to represent himself or herself at an arbitration, it is that much harder to proceed pro se at trial. Conclusion. We live in interesting times. 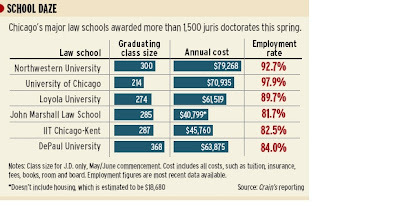 While many new law school graduates are begging for jobs, and with lots of lawyers at all experience levels hurting for business during this never-ending recession, the Illinois Supreme Court has just adopted Rule 10-100, creating a Commission on Access to Justice "to promote, facilitate, and enhance equal access to justice with an emphasis on access to the Illinois civil courts and administrative agencies for all people, particularly the poor and vulnerable." It seems there are more lawyers, and more people needing lawyers, than ever. It might be good to figure out how to get these folks together in ways that would benefit all of them. 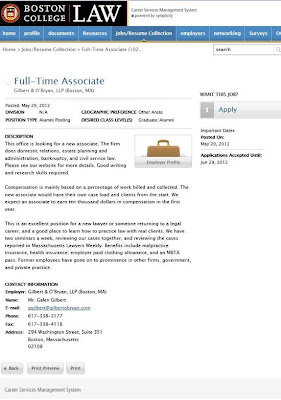 ABA Journal Law News Now updated its story on the Boston law firm looking to hire an associate for $10,000 a year: More than 50 people have now applied. Of course, the job also comes with a bus pass (and a clothing allowance and other benefits). Yesterday, the Chicago Daily Law Bulletin carried a story about a report issued by Law School Transparency, a Tennessee-based nonprofit group that pushed for law schools to report accurate job data. According to their report, only 55% of 2011 law school graduates found full-time, long-term legal employment within nine months of graduation. Mary Kate Malone's article for the Law Bulletin says that, locally, 2011 University of Chicago graduates fared best, with 88% finding full-time, long-term legal work. On the other hand, only 48% of Loyola's 2011 law graduates had full-time, long-term legal work -- and only 49% and 39%, respectively, for graduates of IIT-Chicago Kent and DePaul. The Law School Transparency website can be accessed here. You may have noticed Jerry Crimmins's article about Ald. Edward M. Burke's City Club speech Monday about the forthcoming 200th anniversary of the Battle of Fort Dearborn. With Ald. Burke's sponsorship, the Chicago City Council passed a resolution earlier this month also commemorating the anniversary. 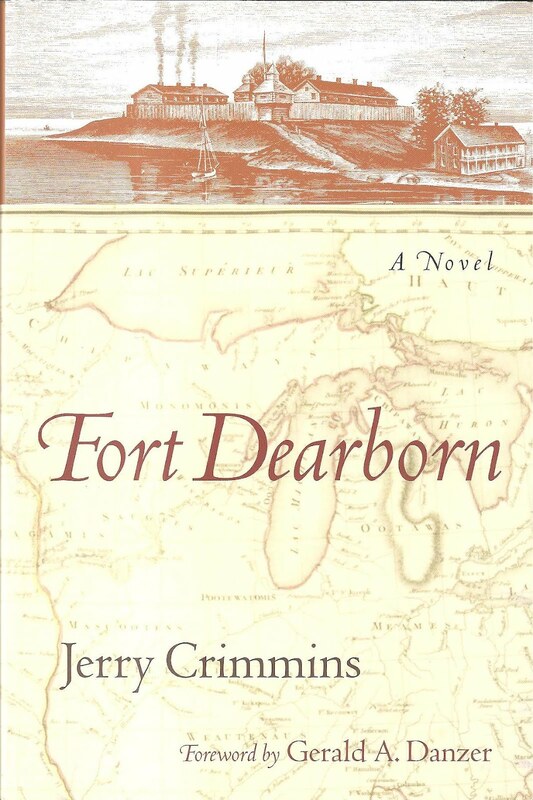 The City Council resolution, Crimmins writes, "says that 'as a result of the battle, 35 soldiers, 12 militiamen, two women and 12 children were killed' on the Fort Dearborn side, and 'as many as 15 Native Americans were slain.'" Just a hunch here, but I'm pretty sure that Crimmins's assignment on this story was anything but accidental. 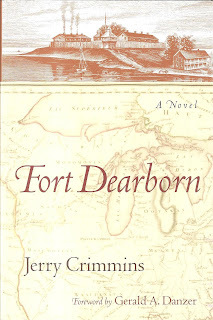 Crimmins is the author of Fort Dearborn, a carefully researched, entertaining historical novel, published in 2006. The Battle of Fort Dearborn is, unsurprisingly, the climax of the narrative. Congratulations 2012 law school graduates: What were you thinking? This is a post I started writing weeks ago -- but it seems like every time I opened my email, there was something new to add. The job is not quite as terrible as the articles make it sound. 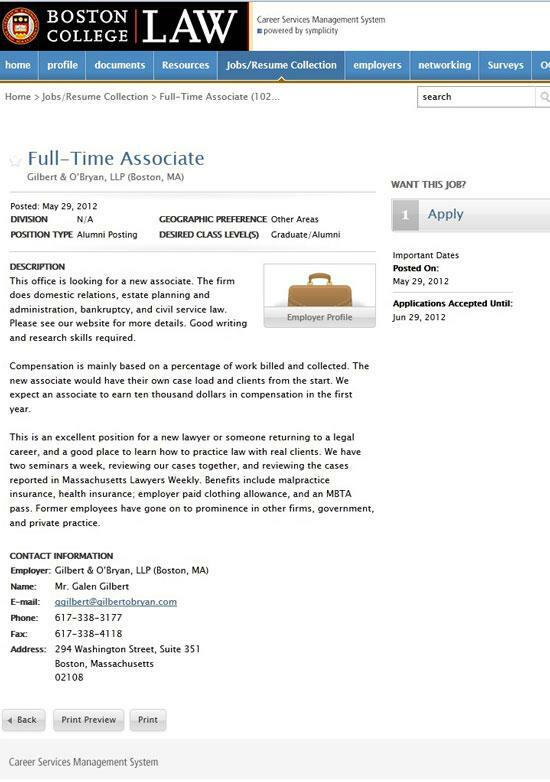 Pay is estimated, based on what the new attorney can likely bill and collect on his or her own case load -- but if you read the ad, the firm would also provide malpractice and health coverage, a bus pass (so the impecunious lawyer can get to and from work), and even an employer-paid clothing allowance. Of course, charts like this recall to mind the phrase often associated with Mark Twain (though he attributed it to Benjamin Disraeli -- and Disraeli wasn't the source either): "There are lies, damned lies and statistics." Who responds to salary surveys? Those who got the prestige clerkships and those who hooked on with silk-stocking firms -- or the ones flipping burgers? In an article that appeared in the January 9, 2011 New York Times ("Is Law School a Losing Game? "), David Segal quoted Indiana University Law Professor William Henderson as saying, "Enron-type accounting standards have become the norm." When a law school claims that x percent of its graduates are employed nine months after graduation, it means employed anywhere -- whether the job requires a law degree or not. A law grad, for instance, counts as "employed after nine months" even if he or she has a job that doesn't require a law degree. Waiting tables at Applebee's? You're employed. Stocking aisles at Home Depot? You're working, too. Segal's 2011 article said that February 15 was the magic date on which employment is calculated for purposes of the all-important U.S. News & World Report law school rankings. I couldn't help but think about the part-time Georgetown jobs when I read Jerry Crimmins's June 1 article for the Chicago Daily Law Bulletin, "University of Chicago pays for jobs for some 2011 law grads." Crimmins reported that the U of C released a chart (like the BC Law chart, above) which showed "stellar occupational achievements" by its Class of 2011. The chart says 199 of 203 graduates, or 98 percent, got jobs. Of those, 181, or 89.2 percent, got jobs that require passage of the bar. 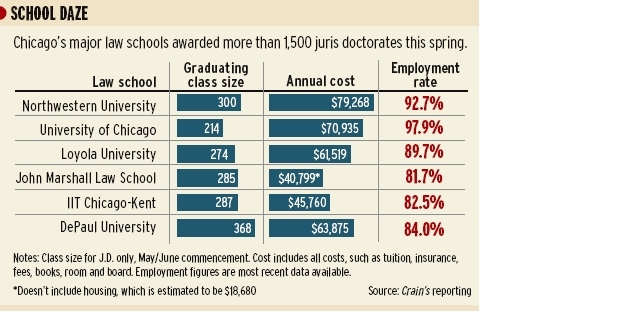 More than half, 117 of last year's graduates took jobs in law firms. Eighty-three of those grads took jobs in the nation's biggest firms with 501 or more lawyers. Twenty were hired in highly sought after judicial clerkships. The median starting salary for full-time, employed graduates of the class of 2011 is $160,000. This is based on salaries reported by 178 of 199 employed graduates. However, according to Crimmins's article, the University of Chicago also announced that "at least 11 percent of its class of 2011 graduates took jobs that were funded by the law school," jobs "that are good for only one year." In the current climate, it is perhaps not so surprising that the U of C is admitting that it has created jobs for a large portion of its 2011 graduating class. Since David Segal's January 2011 article in the New York Times, suits have been filed against a number of law schools around the country, alleging various theories of fraud and misrepresentation, particularly in the disclosure of post-graduation salary and employment prospects. Now, even newly minted law school graduates should know that the mere filing of a lawsuit does not guarantee success -- and, indeed, the first results are encouraging for the law school defendants. Deborah L. Cohen reports in the June 2012 ABA Journal ("Few Jobs, But a Rack of Suits") that New York Supreme Court Justice Melvin Schweitzer dismissed the suit against New York Law School on March 21. According to Cohen's article, Schweitzer wrote, "The court does not view these post-graduate employment statistics to be misleading in a material way for a reasonable consumer acting reasonably." In other words, if you were smart enough to get into law school, you should have been smart enough to see through the rosy employment and salary figures put out by all the law schools. A similar theme was sounded in Sachdev's February 2 Tribune article. William Robinson, president of the American Bar Association, told Reuters in an interview last month, "It's inconceivable to me that someone with a college education, or a graduate-level education, would not know before deciding to go to law school that the economy has declined over the last several years and that the job market out there is not as opportune as it might have been five, six, seven, eight years ago." On June 7, Lorene Yue posted an article on the Crain's Chicago Business website, "2011 law grads' job market worst in 17 years." Shaun Zinck's article for the June 7 Chicago Daily Law Bulletin was headlined, "Stats show dismal job market for law grads." Debra Cassens Weiss's June 7 article on ABA Journal Law News Now was headlined "Only 65 Percent of 2011 Law Grads Have Jobs Requiring Bar Passage, a Record Low." Each of these articles cited to a report issued by the National Association for Law Placement (press release, selected findings). Well... no. Remember Jerry Crimmins's article about the University of Chicago acknowledging that it created jobs for 11% of its graduates? But though law jobs are scarce, even for graduates of the most prestigious schools, there's still plenty of debt to go around. Just yesterday, Rachel M. Zahorsky posted an article on ABA Journal Law News Now, "Law Grads ‘Indentured Servants’ to Loans, Law Prof Says; Law School Crisis a Symptom of Weak Economy." According to that article, the average law school graduate can expect a sheepskin and $150,000 in student loans. Anyway, congratulations to the Class of 2012. Stop reading and go back to studying for the bar exam. Maybe it will work out for you.